New high-resolution images and 3D altimetry from NASA’s Mars Global Surveyor spacecraft reveal the Face on Mars for what it really is: a mesa. May 24, 2001 — Twenty five years ago something funny happened around Mars. NASA’s Viking 1 spacecraft was circling the planet, snapping photos of possible landing sites for its sister ship Viking 2, when it spotted the shadowy likeness of a human face. An enormous head nearly two miles from end to end seemed to be staring back at the cameras from a region of the Red Planet called Cydonia. There must have been a degree of surprise among mission controllers back at the Jet Propulsion Lab when the face appeared on their monitors. But the sensation was short lived. Scientists figured it was just another Martian mesa, common enough around Cydonia, only this one had unusual shadows that made it look like an Egyptian Pharaoh. Above: A 1976 Viking 1 photograph of the Face on Mars. Click here for a 2001 photo from Mars Global Surveyor that reveals the true appearance of the Face. A few days later NASA unveiled the image for all to see. The caption noted a “huge rock formation … which resembles a human head … formed by shadows giving the illusion of eyes, nose and mouth.” The authors reasoned it would be a good way to engage the public and attract attention to Mars. checkout lines for 25 years! Some people think the Face is bona fide evidence of life on Mars — evidence that NASA would rather hide, say conspiracy theorists. Meanwhile, defenders of the NASA budget wish there was an ancient civilization on Mars. And so on April 5, 1998, when Mars Global Surveyor flew over Cydonia for the first time, Michael Malin and his Mars Orbiter Camera (MOC) team snapped a picture ten times sharper than the original Viking photos. Thousands of anxious web surfers were waiting when the image first appeared on a JPL web site, revealing … a natural landform. There was no alien monument after all. 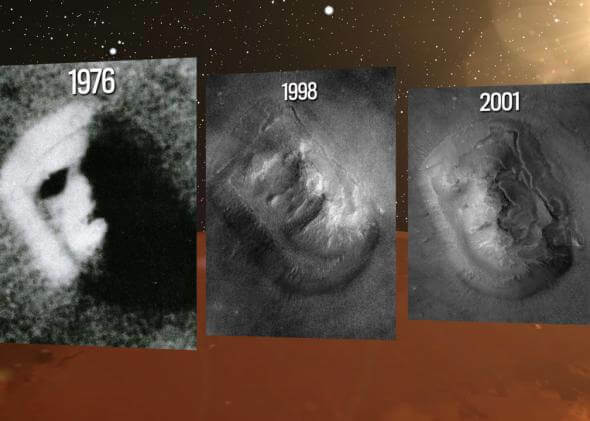 Above: Side by side: a Viking 1 photo from 1976, a Mars Global Surveyor (MGS) image from 1998, and the latest MGS image from 2001. View the 2001 photo in dazzling high-resolution! But not everyone was satisfied. The Face on Mars is located at 41 degrees north martian latitude where it was winter in April ’98 — a cloudy time of year on the Red Planet. The camera on board MGS had to peer through wispy clouds to see the Face. Perhaps, said skeptics, alien markings were hidden by haze. Mission controllers prepared to look again. “It’s not easy to target Cydonia,” says Garvin. “In fact, it’s hard work.” Mars Global Surveyor is a mapping spacecraft that normally looks straight down and scans the planet like a fax machine in narrow 2.5 km-wide strips. “We just don’t pass over the Face very often,” he noted. Nevertheless, on April 8, 2001 — a cloudless summer day in Cydonia — Mars Global Surveyor drew close enough for a second look. “We had to roll the spacecraft 25 degrees to center the Face in the field of view,” said Garvin. “Malin’s team captured an extraordinary photo using the camera’s absolute maximum resolution.” Each pixel in the 2001 image spans 1.56 meters, compared to 43 meters per pixel in the best 1976 Viking photo. Right: “Gee, it doesn’t look like a face to me!” by artist Duane Hilton. Cydonia is littered with mesas like the Face, but the others don’t look like human heads and they’ve attracted little popular attention. Garvin and other members of the MGS Science Team have studied them carefully, however, using a laser altimeter called “MOLA” on board Mars Global Surveyor. The laser altimetry data are perhaps even more convincing than overhead photos that the Face is natural. 3D elevation maps reveal the formation from any angle, unaltered by lights and shadow. There are no eyes, no nose, and no mouth! Above: A 3D perspective view of the Face on Mars landform produced by Jim Garvin (NASA) and Jim Frawley (Herring Bay Geophysics) from the latest MOC image (April 8, 2001) and all of the available laser altimeter elevation measurements by MOLA. There is no vertical exaggeration in this ray-traced image. Garvin and Frawley express special thanks to Mike Malin and MOLA science team. See also these false-color 3D views. south and smoother lowland plains to the north. Some scientists think the northern plains are all that’s left of an ancient Martian ocean. If so, Cydonia might have once been beachfront property. Below: Cydonia (labeled blue) inhabits a transition zone between southern highlands and a northern plain that perhaps once contained a Martian ocean. Click for the full Mars Atlas. Perhaps the best way to unravel the mystery would be to send a geologist to investigate. And Garvin, an enthusiastic climber, wouldn’t mind going himself. “From there the view would be spectacular,” he continued. “To the south the ground would slope upwards, toward the highlands. To the north the terrain would descend toward the plains. Looking around you would see a barren landscape dotted with buttes, mesas, and impact craters,” a curious mix of the bizarre and the familiar. connection. But even without an alien monument, there will be plenty for future explorers to do. Climbing the mesas of Cydonia –if that’s where we start– will be just the beginning. Unmasking the Face on Mars wasn’t easy! But Michael Malin and his team at Malin Space Science Systems have done it by virtue of their hard work targeting the Face with the Mars Orbiter Camera (MOC). To see more dazzling images of the Red Planet please visit the online MOC Photo Gallery — it’s worth the trip. Chief Scientist for NASA’s Mars Exploration ProgramHike length is approximately 5.5 km or 3.6 miles one way, with a total elevation gain of nearly a thousand feet. Rating…. easy at start and midsection, with some very steep sections. Take plenty of water and oxygen. NOTES: Starting to the SOUTH, away from the Face (hereafter FOM), the hike begins with a walk to the scree slopes at the south base of the feature, and then moves to the right (east) around the base of the FOM, and then to the NNW up to a breach in the feature about midway through the eastern middle. At this point there is a passage up the east flank of the feature, and the hike takes this route, passing between the two ridge-like prominences that outlie the eastern “battlements” of the FOM… then the hike traverses a smoother patch before it turns and skirts the summit region before finding a circuitous path to the upper reaches of the FOM (where there is a flat, bright circular patch about 100 m in diameter).